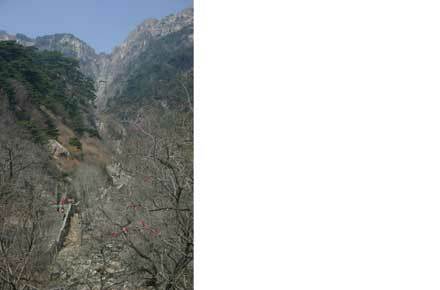 China's most sacred Taoist mountain, 1,545m of broken cliffs and boulders in which twisted little pines make a precarious living. Huge cultural importance: some 3,000 years of religious significance have left a marvellous array of temples, pavilions, gates and calligraphy everywhere. 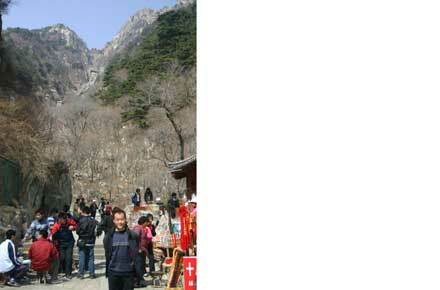 As one of China's most famous sites, it is usually very crowded: think people-watching, not quiet communion with nature. 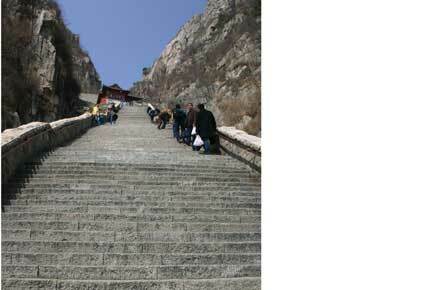 This is a tough walk of over 6,000 steps. Some fitness will help - and come prepared for mountain weather. Chinas paramount Taoist Mountain, Tai Shan, is special; a place where emperors came to give sacrifice (it is Chinese slang for father in law), crammed with historic buildings (albeit not as ancient as they might have been, thanks to the glories of the Cultural Revolution), pullulating with myth and story, poetry and art. Even Mao Zedong got in on the act, declaring here that the east is red. 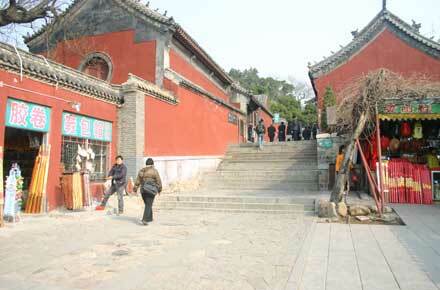 The area is, with justice, a World Heritage Site. 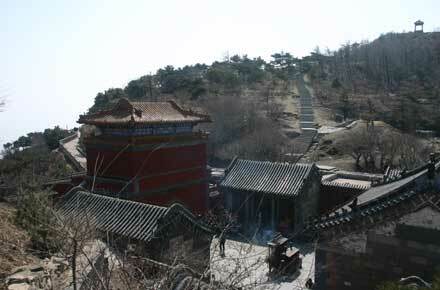 It is said (by Wikipedia) that there are 22 temples, 25 gates and arches, 97 ruins, 819 stone tablets and 1,018 inscriptions on Tai Shan. There are many ancient trees to revere. You sometimes feel as if every stone and tree is significant. 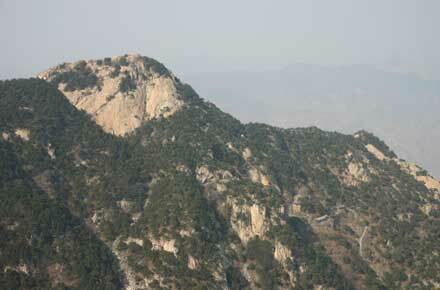 The mountain rears, with little in the way of preliminaries, from the great North China Plain to its 1,545m height. And it does so dramatically: given the antiquity of its gneiss rock, it is remarkably jagged and new-looking. 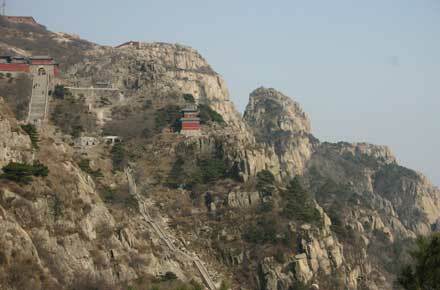 Below the cliffs and spires of the peak, steep edges are littered with huge boulders and patched with slopes of bare rock. Crooked little pines and pretty deciduous trees struggle to make a living in its crevices. 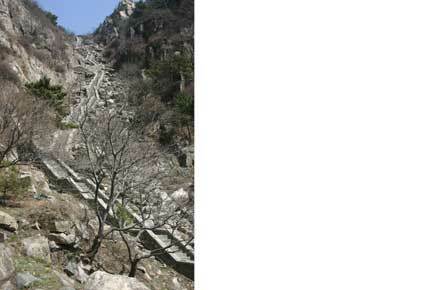 You will need to climb the Central Route (although there are alternatives, including a cable car, as described below): this was the imperial route, and has the detritus of history to show for it. 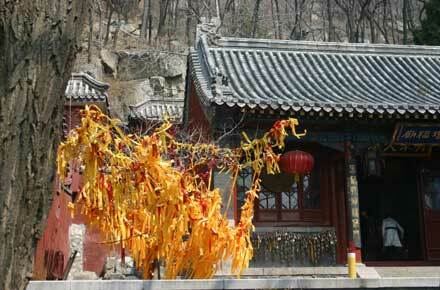 From the Hong Men gate, it climbs fairly steeply up a valley. 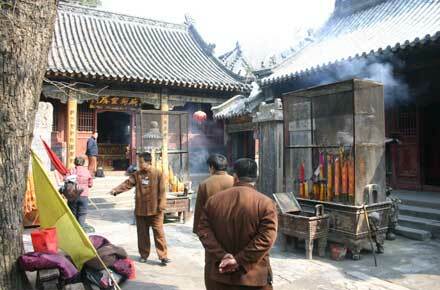 At first there are houses and orchards as well as the temples, pavilions and steles. These give way to wooded hillside, but there is consistency on the whole route: it is made of hewn stone steps and slabs, it is steep, it is pretty crowded at most times of year and you are seldom out of sight of a stall. It is heaven for people - watchers: all types make the climb, from the ludicrously old to the impossibly young. 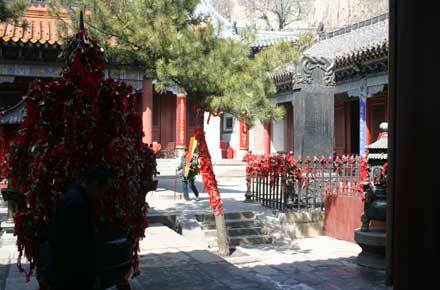 The buildings and inscriptions that line the route are intriguing, although most are heavily restored. Foreigners are at a disadvantage, as their ignorance of the cultural and religious significance and illusions is exacerbated by missing out on the subtle poetry of the steles. 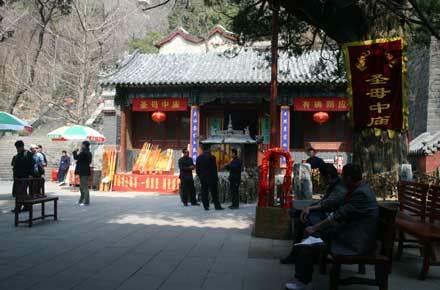 The deity you will get to know well is Bixia, the Princess of The Azure Clouds, who can be seen in many of the temples en route. 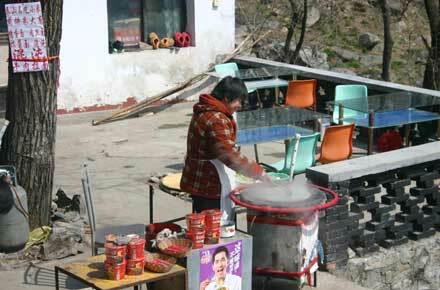 She has serenely outlasted the worst that the Cultural Revolution could throw at her. 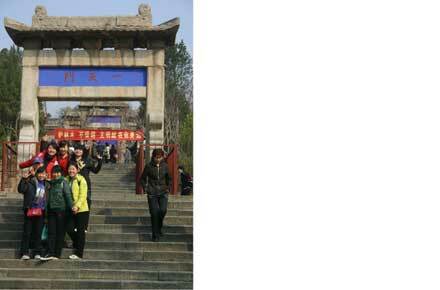 This is a tough walk, said to be 6,660 steps (figures range from 6,300 to 7,200) to the Nantian Men Gate at the top of the last, terrible, flight of steps. 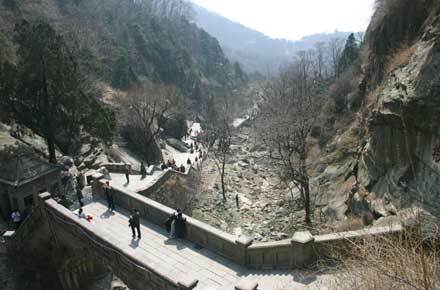 While it is outgunned by Huangshan and Emei Shan, to name but two famous Chinese mountains, it should be high on the travelers list, unless he/she has explored another sacred mountain. The circuit around the peak area is easily the most enjoyable part of the mountain, if you get a good day (even in the fairly regular mist, it can be deeply atmospheric). 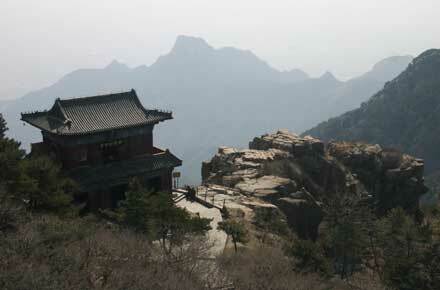 There are beautiful, interesting and ancient temples and pavilions, and some wonderful views of the range in its full glory (you have to forget the town (population of over 5m) of Taian huddled around the base). 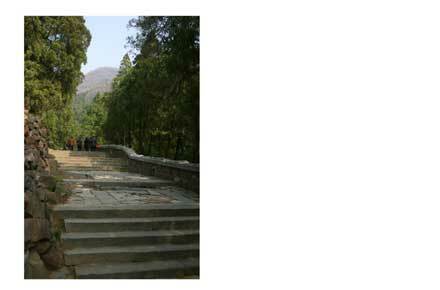 You can even find a scintilla of solitude at the further ends, away from the hoots and hollers of the groups, and you can feel your way toward the deep contemplation that was once essential to a pilgrimage here. We have a lot of helpful practical information and tips about this walk, covering everything from the best books and maps, to timing and weather, geting there, possible problems, whether you need a guide and where to find them, and useful websites. This section is only open to members. Add your experiences, suggestions and photos. We would be delighted to receive your writing and ideas (which will be attributed appropriately where published).